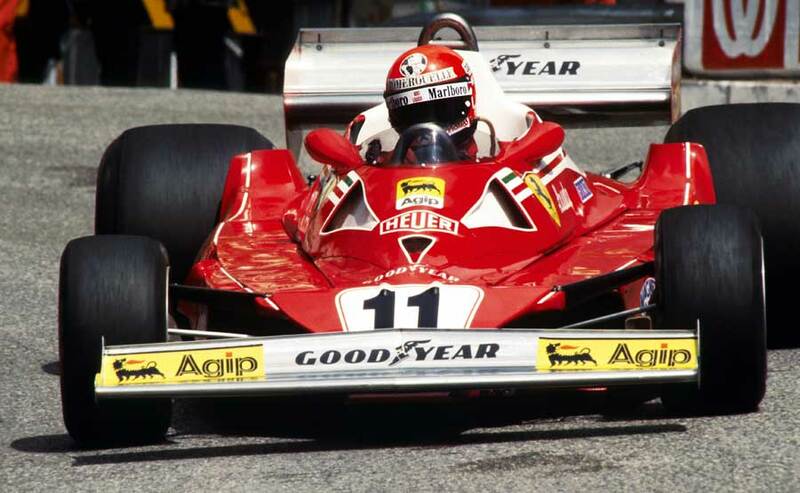 Niki Lauda was most certainly not the fastest driver, but he was consistent and the Ferrari proved to be extremely reliable. He succeeded in beating off strong challenges from Andretti, Hunt and Scheckter to win his second title. After three seasons Scheckter quit Tyrrell to join an intriguing new team, Walter Wolf Racing. Hunt and Mass stayed at McLaren to drive the new M26, the replacement for the ageing M23 and, even before the end of 1976, Reutemann left Brabham to join Ferrari. Peterson replaced Scheckter at Tyrrell, and Watson left the now defunct Penske team to replace Reutemann at Brabham. Chapman had pulled another surprise, providing Andretti and his new team-mate, Gunnar Nilsson, with the stunning 78, the first "ground-effects" car. It had prominent side pods with sliding skirts which produced masses of downforce. The latest Brabham-Alfa was quick, Watson leading the opening race in Argentina until it broke. Team-mate Carlos Pace and Hunt also led, but victory went to Scheckter and the new Wolf. Ferrari was also competitive. Reutemann won in Brazil, and then at Kyalami Lauda scored his first success since his accident. The race was marred by the death of Tom Pryce, the Welshman hitting a marshal who ran across the track. Before the next race Pace lost his life in a plane crash. Scheckter led most of the way at Long Beach but, when he punctured, Andretti went ahead to give the Lotus 78 its first win. He quickly added a second in Spain. Scheckter took his second of the season in Monaco, which marked the 100th win for the Cosworth DFV. In Belgium there was a typically confusing wet race and it resulted in a fine win for Nilsson in the second Lotus. Hunt had had no luck in his title defence, but at Silverstone he beat Watson in a splendid duel. The race saw the debut of Jean-Pierre Jabouille's Renault and its V6 turbocharged engine. Lauda scored Goodyear's 100th win in Hockenheim, and once again Austria produced an unusual result, Alan Jones giving Shadow its first win in another damp encounter. The summer witnessed a spate of Cosworth engine failures. Andretti had four in a row, and Hunt and Scheckter also suffered. Meanwhile, Lauda quietly racked up the points, scoring another win in Holland. Andretti's car held together long enough for him to win in Monza. At a wet Watkins Glen Hunt won after Stuck crashed, but Lauda's fourth place clinched the title. With that, he upped and left Ferrari. There were still two races left. Scheckter won in Canada, after Mass tipped team-mate Hunt off. James ended on a high note with a win in Japan, where this time the sun shone. But the race was marred by the deaths of two spectators after Ferrari new boy Gilles Villeneuve tangled with Peterson and the car flipped over the barrier. Fittipaldi had another bad season with his own car, although he occasionally broke into the top six, while Peterson and Depailler struggled all year with the latest six-wheeler. At the end of the year Tyrrell ditched the concept. In contrast, fellow veteran Regazzoni did great things with the little Ensign team, picking up a few points.